Following the city’s recent refusal to broadcast the hearing on public access television, made public earlier this month, The Lens decided to livestream the hearing. The consent decree can only be terminated when the police department has sustained compliance with the provisions of its provisions for two years. In a December letter to the court — entered into the court record earlier this month — City Attorney Sunni LeBeouf said the department has reached more than 90 percent compliance with the consent decree. But in a response, Aronie said that “substantial work” still needs to be done. Unlike past hearings in the case, Friday’s meeting was not held in a federal courtroom. Instead was be held at Loyola University’s Law School. In another departure from normal protocol in the consent decree case, the media was allowed to videotape the proceedings. Initially, the city of New Orleans was set to broadcast the event on public access television. But Mayor LaToya Cantrell’s office objected to that. In the Dec. 6 letter — signed by Mayor LaToya Cantrell, former Police Chief Michael Harrison and City Council Members Jason Williams and Helena Moreno — City Attorney Sunni LeBeouf wrote that a televised hearing would “more appropriately occur concurrent with a compliance determination,” meaning when Morgan determines that the department has substantially met its obligations under the reform agreement. “The City believes such a determination is ripe to occur in the very near future,” LeBeouf wrote, saying that the NOPD’s Compliance Bureau has determined that the department has reached 93 percent compliance. The city must demonstrate “full and effective compliance” with the consent decree — a sweeping document that covers everything from police shooting investigations to officers’ off-duty security details — for two years in order for it to exit federal supervision. It appears that Aronie did not agree with the Cantrell administration on how far the city has come. The terms of the consent decree were unveiled by the city and the U.S. Department of Justice in 2012. That announcement followed a 2011 Justice Department investigation finding that the NOPD had engaged in “patterns of misconduct that violate the Constitution and federal law,” including racial profiling and the use of excessive force. To formalize what was then an agreement between the city and the federal government, Justice Department lawyers filed suit against the city in federal court. Morgan approved the agreement in January 2013. 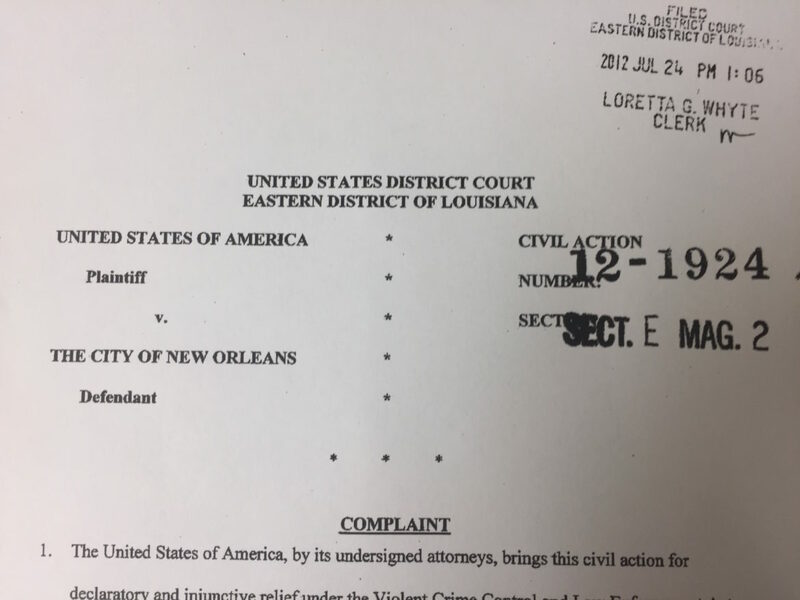 On the same day, then-Mayor Mitch Landrieu — who had requested the federal investigation in 2010 and appeared with then-U.S. Attorney General Eric Holder at the 2012 Gallier Hall press conference announcing it — said the city wanted out of it. Landrieu said the city couldn’t afford the costs of the consent decree — estimated at $55 million over five years to pay for new equipment and for the monitoring team, among other costs — when it was simultaneously facing another expensive consent decree, over unconstitutional conditions at the city’s jail. Morgan later denied a motion from the city to vacate the consent decree. LeBeouf’s letter said the city will have spent about $55 million by the end of this year, including more than $10 million on fees and costs for the monitoring team alone. 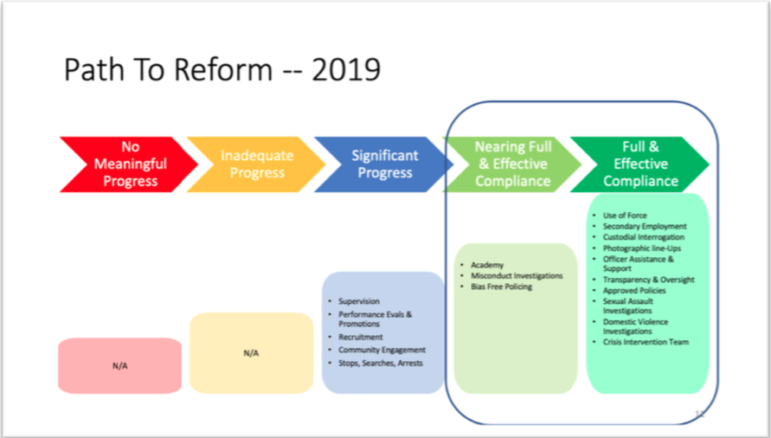 The department’s progress was slow at first, but even though it has yet to reach full compliance, the department has since made significant gains, as Aronie noted in his response to the city’s letter. “While we cannot say, based on our monitoring, that the Department will be in full and effective compliance in those areas in the ‘very near future,’ we certainly agree the Department’s overall progress to date has been admirable – especially considering the Department’s slow start,” he wrote.